Today we might call these fabrics 'decorator designs'. The scale is larger and the elements often more exuberant. Merchant ledgers of the 18th and 19th Century referred to these fabrics as Furnishing Goods. The large printed garlands in Dargate Treasury from Andover Fabrics are a good example of c. 1830 Furnishing goods. Ground colors popular 1815-1835 were white, tea dyed, yellow and light blue. These grounds were generally solids. The combination of a finely printed ground with block printed florals began with the development of steel mills in the mid 1830s. Often the small mill engraving backgrounds were printed separately and used as backings for quilts. The tan color above is the document coloration. The pattern however, is a bit smaller than the original for two reasons. Today's goods offer 4 complete repeats of the large garland across the fabric. Five of the smaller design. In the original piece...the two different garlands are so close together some elements actually touch. I wanted enough space between the two floral garlands to be able to cut/sew each design separately. Ribbons, an important fashion accessory, woven in the early 19th century often used a warp of one color with a different color of weft. In fabrics this would be called shot colors or chambrays. I am using several of these Chambrays by Andover Fabrics in quilts I am designing for the Dargate Treasury line. The Linen color is subtle and supportive while the Coral and Plum add a sparkle. Dargate Treasury fabrics will be available late April and my quilt patterns by mid May on my website, Reproduction Fabrics.com. Thanks for sharing. 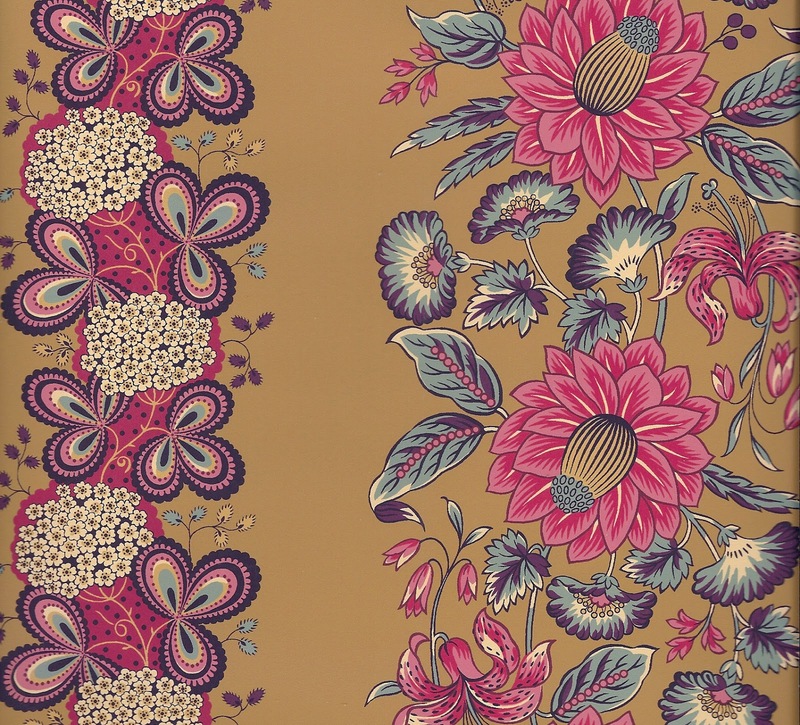 Although these fabrics are popular in the 18th or 19th century, I still love their decoration designs.